FIBA U17-July 10: Burdick is easily the loudest on the team both in volume and character. There is rarely a moment with a straight face as she was always either smiling or scowling. What was evident her in France is what started emerging this spring, she is an impact player as the No. 2 option. Sure she has the physical tools to be the go-to, Michael Jordan, role. But when surrounded with other uber-talented players she is at her best using her versatility to play the Scottie Pippen role. Or perhaps being Tina Thompson, not Cynthia Cooper or Sheryl Swoopes. She is the perfect answer at the high post for the international game as there is always a long help defender waiting inside of five feet. With her ability to face up and knock down the open jumper or create, she gave the Americans an advantage. She struggled when she was closer to the basket and in tight spaces and under duress she stays with her right hand, even if the left would provide a better angle or protect the ball better. If she can really hone in on being able to duplicate everything she does inside with her right hand for her left she's going to take off in college as do-everything player. Nike Regional Skills-May 10: Burdick solidified our opinion from Boo Williams last month. She has her moxie back and approached the Skills Academy as you would expect an upperclassman of her caliber to. She continues to excel at the 4 position. In goofing around between sessions she showed off her athleticism by trying to dunk. She was above the rim but just hasn't found the timing yet, not that it is a viable game shot as she'd need a runout with a clear path. Regardless, she is a tremendous athlete with perimeter skills which makes for a nightmarish matchup for other forwards. Boo Williams-April 10: Whether it was a new team, a different position of just having future coach Pat Summit of Tennessee courtside, Burdick played some of her best club basketball in a while. There was an energy and enthusiasm that allowed the 6-2 Matthews, N.C., native to be a force at the forward spot alongside new Boo Williams teammate Elizabeth Williams. Working almost exclusively at the forward spot she was effective with her short and mid-range games and offered some high-low options with Williams that would give any opponents nightmares. The aggressiveness that she played with had an impact defensively but really paid off on the glass as she gathered in almost every ball that came her way. If she continues to play with the same approach the well-known potential could become reality. It's crowded at the top of the 2011 class but her play reminded some of why she's already at No. 6 and looking to climb a rung or two. Nike National Skills Academy - July 09: Cierra Burdick has all the tools to be the most dominant player in her class. The 6-2 wing out of North Carolina and Butler High School has great size, impressive athleticism and refined skills. Ranked No. 3 in the initial ranking of the 2011 class, Burdick may climb those next two rungs on the ladder before all is said and done. A true nightmare for opposing defenders, she has the size to post up a smaller guard as well as the skills to attack and go by opponents with more height. She finishes around the rim effectively and has a running floater that is difficult to stop. She shoots it well from the perimeter and has the range to go deep. The missing aspect in her shooting is consistency, which appears to be the result of a forward motion in her shot. What will have to come for her to take the next step in her play is a willingness to dominate every play. She seems to pick her spots and use measured effort at times rather than take over as she's capable. She has the potential to make an impact on virtually every play. USA U16 Trials-May 09: If you're looking for fire and personality on the floor you can look to Cierra Burdick from the Tar Heel state. Her physical gifts are as impressive as anyone in her class. She is 6-2 with guard skills. She has an awkward, but effective floater that she uses in traffic because she's not quite there with her jumper. She hit some open shots -- some from 3-point range -- but perimeter shooting is her main area for improvement. She's a crafty passer who isn't afraid to thread the needle to make a play, which only complements her break-down skills with the ball. With her length, she can make passing lanes disappear. Nike Regional Skills Academy-April 09: Connecticut's Maya Moore may be setting a new standard for versatility on the college level and she's got a sister in arms doing the same thing in the high school ranks. North Carolina resident Cierra Burdick has the tools to be effective at almost any spot on the floor other than posting on the low block. Not that she couldn't at 6-2, it's just that she offers too much elsewhere on the court. She has the perimeter skills and court instincts to create both her own shots as well as passes leading to scoring opportunities for her teammates. She can impact a game in transition by handling the ball or running the floor. In the half court she penetrates while reading defenders and demonstrates good decision making skills. One decision she may want to rethink is her willingness to give the ball up quite so easily. She'll need to be more of a constant threat to keep defenders honest now that she's an established target. Deep South Classic - April 09: A 6-2 wing or maybe even guard with shake, shimmy and swagger, Cierra Burdick is another branch sprouting out of the basketball family tree -- meaning she has a chance to be an evolutionary kind of player. She is explosive, knows her way around the low post and can go old school with her Kareem-alike sky hook. But Burdick, out of Charlotte, N.C., is one of those rare players, at least in the ponytailed version of the game, who can create her own shot, whether it be a high-lifting perimeter hoist, mid-range pull or all-out attack on the cup. What's more, she's probably more inclined, at this stage, to use her abundant gifts to make plays for teammates and still is collecting the ingredients to cement an assassin's mentality that could elevate her to the very top of her class. 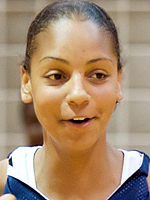 Bojangles Jan. 09: Cierra Burdick has a developing game that will make her one of the top players nationally in two years. At 6-2, Burdick is long and skilled, can play guard or forward, can play inside or outside, and can guard multiple positions. Burdick was phenomenal in Butler semifinal win over cross-town rival East Mecklenburg. She registered 14 points, 13 rebounds and 5 blocked shots. She was very effective around the basket on both ends. She gathered herself and her length for scoring opportunities around the basket against her much smaller opponents. She rebounded on the defensive end and ignited the break with the pass instead of the dribble on several occasion finding streaking players up court. Burdick also was a terror defensively altering several shots throughout the game. Look for this name among the top players nationally in the class of 2011.